In a not-so-distant past, Tata Motors rolled out its Zest which changed the way people looked at the brand. The car is more reliable than the previous generation Tata cars, handles as good as, or even better, than the competition. But in the war of Zest vs Dzire, is the car good enough to beat the likes of top of the food chain which is ruled by the Maruti Suzuki Dzire. The Tata Zest has a really striking front end and sharp sides. A strong shoulder line, as well as another styling line towards the bottom of the doors, makes it quite attractive. Of particular note are the front headlights, which now feature projectors – a first for the segment – as well as LED daytime running lights and LED taillights. The instrument cluster is now back in front of the driver rather than in the middle of the dash. The Tata Zest has, by far, the finest interiors that Tata has ever produced. The top model of the Tata Zest features a touchscreen audio system with Bluetooth functionality and voice controls that actually works really well. The car features two engine options: First is the ubiquitous 1.3-litre diesel engine sourced from Fiat, which is in 90bhp trim, and the second is the brand new 1.2-litre Revotron turbocharged petrol that has been freshly developed by Tata. The diesel engine makes a fresh case for itself with the AMT (Automated Manual Transmission) that it comes with. The Tata Zest is the first car in its class to feature a diesel automatic. From behind the wheel, the engine is quite pleasing – giving the car enough poke for everyday use. However, in regular auto mode, the gearbox seems to throttle the engine’s response – perhaps the gearshift points have been programmed to maximise fuel efficiency, and so it feels a bit slow to respond. Things, however, improve massively when you switch to Sport mode – with response improving significantly since shifts take place at a higher rpm’s. So, for the first time, here’s a Tata product that’s been engineered with a clear focus on consumers – and with quality levels to justify its price and positioning. The design, class-leading equipment levels, refinement, suspension setup, build quality, and space make the Tata Zest a very appropriate vehicle with which to reinvent a brand and its reputation. It hints towards a bright future not only for the Tata Zest, but also for the products to follow. 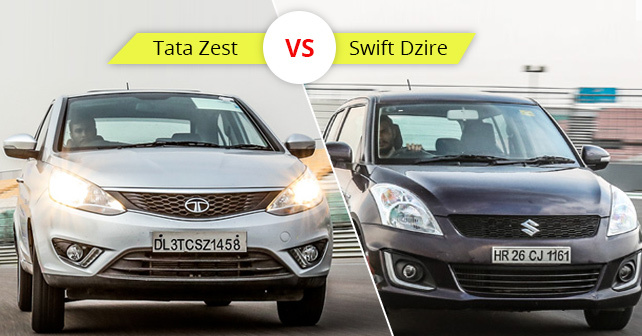 The core thing here, however, remains the Tata Zest vs Dzire – the bestseller in this segment. This is the car that started it all. The concept of a compact sedan based on a highly successful hatchback. Keeping up with the pace of the industry, Maruti Suzuki launched the third generation of the Dzire in February this year. Considering the fact that the Dzire uses the same engine as the Tata Zest, and also considering that it’s tuned to produce 15 horsepower less, it was way quicker during our Zest vs Dzire comparison. Probably because the chassis of the New Maruti Suzuki Dzire feels a lot more chuckable and willing than Zest’s. And, secondly, it’s about 100 kilos lighter – which is something you will certainly notice around those turns.